In case you missed it: Weirdomusic.com is ten years old this year. A good reason for a party, don’t you think? We will celebrate 10 years of Weirdomusic on March 3 at Cultuurhuis Heerlen (The Netherlands) with The Spinshots, Fusée Dorée, DJ Natashka and DJ King Mobe. Tickets are available here [info in Dutch]. 10 years of Weirdomusic.com: let’s celebrate! Sometime in january 2002 a young man from Heerlen, The Netherlands got a brilliant idea: he registered the domain name Weirdomusic.com and began a website. The rest, as they say, is history. The 10th anniversary of Weirdomusic.com will be celebrated on March 3 in our hometown Heerlen [buy tickets], but for all you fine folks who can’t attend we have something else in mind: why don’t you celebrate with us from your own cosy homes? Here’s the idea: send us your birthday wishes in a video message and we’ll publish them here and on YouTube! Talk, sing or dance, whatever you like, as long as you mention Weirdomusic.com. – Your clip should be no longer than two minutes. – Please don’t use any exotic file formats. Use something we know, like mpeg or wmv. – Please use a service like Sendspace.com or WeTransfer.com to send your video. – The e-mail addres to use is marco@weirdomusic.com. – Don’t forget to send us your name and contact details. We may want to give away some presents. – We will publish your video on Weirdomusic.com, our YouTUbe Channel and our Facebook page. So, hook up your (web)cam and get to work! Questions? Just drop us a line. It’s no secret that here at Weirdomusic HQ we like The Residents a lot. Over the years we have reported on their activities on a regular basis and we still pop their CDs into our player on a regular basis. Imagine our surprise when a couple of days we started to receive a lot of traffic to our site from the official Residents website. 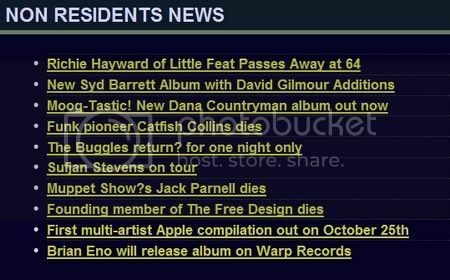 It turns out our news feed is now the source for all “Non Residents News” on the site of the Eyeballed Ones. How cool is that? Want to add our news feed to your site as well? Please go ahead and grab the rss feed here. Weirdomusic.com is always looking for volunteers who would like to contribute reviews (or other content) to our website. Weirdomusic.com is always looking for volunteers who would like to contribute reviews (or other content) every once in a while.